Do you think you are having trouble with your gallbladder? Maybe you have a condition called gallstones. Gallstones are also called Choleliths. They are hardened, crystallized bile fluid that are developed by the gallbladder. They can vary in size. Some may be as large as a golf ball, or as small as a grain of sugar. The cause can be due to lack of bile salts or high cholesterol levels. Symptoms include back and abdominal pain that happen after eating a meal. Some symptoms may be relieved naturally depending on the size and severity of your gallstones. There are some steps that can be taken that are easier than automatically assuming that surgery is needed. These natural steps may completely resolved your gallbladder symptoms before surgery becomes necessary. Natural home remedies may help relieve the pain and discomfort that is also associated with having gallstones. Change your diet. Diet is important in healing the body with any disease or combination of symptoms. Eat foods that are low in cholesterol. An increase in eating fresh fruits and vegetables can help prevent a gallstone attack altogether. You should eliminate dairy and fatty meats from the diet. If you notice that specific foods trigger gallstone attacks, then you should avoid those foods in combination as well. When you are having a gallstone attack try some hydrotherapy. The use of water can be used to soothe various symptoms associated with many diseases in the human body. Take a hot shower first. Make the water as hot as you can possibly stand it. They take a completely cold shower. This method shocks the system and helps to relieve the gallstone discomfort. 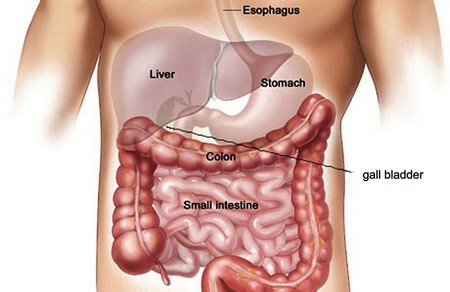 Here is a natural home remedy that may dissolve your gallstones. Make a drink of 2 parts apple juice to one part apple cider vinegar. Drink the mixture once an hour. This helps to dissolve the gallstones because of the acidity of the apple cider vinegar. This method may help to do away with smaller gallstones. Make an appointment to go see a doctor. After it has been confirmed that you have gallstones your doctor may prescribe you bile salt tablets called Ursodiol. This medication helps dissolve small gallstones. To help with pain management, your doctor may also suggest Tramadol while the process of dissolution runs its course. If none of these options work and the pain is persistent, the suffer may opt to have surgery. The removal of the gallbladder is called a ‘cholecystectomy’. As with any surgery there my be slight adjustments post operation. After the removal of the gallbladder the gallstone symptoms should be completely gone.